The Primetime Performer awards program – also utilized on affiliate sites CollegeSoftball360.com, CollegeSports360.com, CollegeSoccer360.com and CollegeFencing360.com – seeks to recognize players based on more than simple raw stats, instead taking into account quality of opponent, contribution to team success and various situational factors (such as clutch play, all-around performance, leadership, adversity overcome, etc.). The week-13 Primetime Performers list features one first baseman, a third baseman, a shortstop and a rightfielder, plus six pitchers (three RHPs, three LHPs) and three multi-positional players: Green (LF/C) along with a pair of two-way talents (see below). The 13 include two seniors, four juniors, six sophomore and one freshman. Three hail from Texas hometowns, plus one each from California, Georgia, Florida, Illinois, Indiana, Kansas, Missouri, Ohio, Rhode Island and Tennessee. In addition to Green and Magallones, the other week-13 Primetime honorees include: East Tennessee State sr. RHP Kerry Doane (Ft. Lauderdale, Fla.) … South Alabama sr. RF Nolan Earley (Anderson, Ind.) 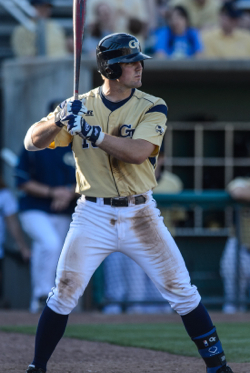 … Georgia Tech jr. C/DH/RHP Zane Evans (Roswell, Ga.) … Kansas State so. 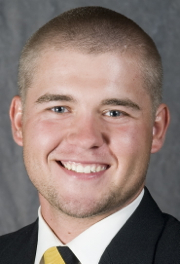 SS Austin Fisher (Lenexa, Kan.) … Iowa so. LHP Sasha Kuebel (St. Louis, Mo.) 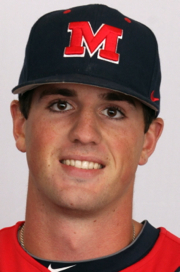 … Mississippi jr. RHP Mike Mayers (Grove City, Ohio) … Texas A&M so. 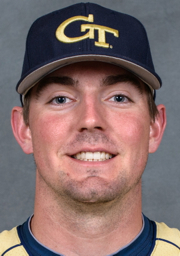 RHP/DH Daniel Mengden (Houston, Texas) … Bryant fr. 1B Robby Rinn (Warwick, R.I.) … Memphis jr. LHP Erik Schoenrock (Collierville, Tenn.) … Sam Houston State jr. LHP Caleb Smith (Huntsville, Texas) … and UC Irvine so. 3B Taylor Sparks (Long Beach, Calif.). 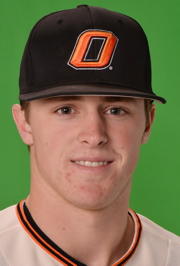 GREEN (pictured at left) proved to be a versatile bottom-of-the lineup player while sparking Oklahoma State to a Bedlam Series win in the annual battle vs. rival and cb360 #27 Oklahoma (4-3 in Tulsa; 4-5 & 7-2 in OK City). The sophomore hit 7-for-10 in the tightly-contested series, with a couple of doubles, two RBI and three runs scored (also a walk, stolen base and sacrifice bunt). He matched his career-high with three hits in the series opener (3-for-4; RBI, R, 2B) – including a 2-out RBI single that plated the eventual winning run in the top of the 8th. The team’s typical leftfielder, Green started game-1 behind the plate due to Victor Romero’s injury (Green had made only three previous starts at catcher). He went on to play a key role in the series-clinching second game, with a double, run, walk, stolen base and sacrifice bunt. Green smacked a leadoff double in the 8th inning of game-2 and ultimately stole home (pictured) for a valuable insurance/winning run (4-2; 4-3 final). He ended the series by batting 3-for-4 with another RBI and run. MAGALLONES (pictured at right) went the distance in a dominant 2-hit performance, allowing only one runner past first base while leading Northwestern to a 12-1, series-tying road win vs. a CB360 #13 Indiana team bidding to become one of the 16 NCAA regional hosts. The 6-foot-3 righthander faced only 29 batters in an efficient 91-pitch outing that included no walks and two hit batters. Over the course of his fifth complete game this season, Magallones shut down a prolific Hoosiers offense that leads the Big Ten in batting average, slugging pct., on-base pct., walks and runs. He carried a no-hitter into the 5th, after retired the first eight batters he faced and having allowed only two baserunners prior to the 6th. Magallones kept the ball in the infield for most of the game, with 23 of his 27 outs coming via strikeouts (6), groundouts (11), infield popups/foulouts (4) and the two erased baserunners (lineout double play & caught stealing). • Must have been playing for or against a CB360 top-50 team (in the Composite National Rankings or performed a high level in games that could be key to a team’s conference/NCAA postseason qualification; made significant contribution to team’s success and potential postseason positioning (single-game wins, “quality” wins, series wins, road wins, etc.). • Overcame adversity, extra challenges or extreme circumstances (for the team and/or individual). 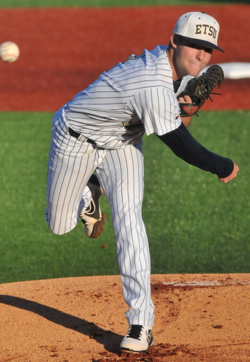 East Tennessee State … RHP … Sr.
Intriguing success story who has excelled during his first full season as a starting pitcher … was recruited as a pitcher but ended up filling a team need as the starting shortstop over the previous three seasons, before turning his full focus to becoming a starting pitcher this season … coming off his NCAA-leading 10th complete game and fourth shutout of the season, after outdueling previously unbeaten Brandon Barker in 1-0 opener vs. current Atlantic Sun Conference leader Mercer (cb360 #24) … faced only 32 batters in that 5-hit, 5-K performance vs. the Bears, helping keep ETSU in the mix for a finish near the top of the A-Sun … limited the potent Mercer offense (51 home runs; 7.5 runs per game) to five total baserunners, with no walks or hit batters in pressure-packed game that was scoreless until ETSU’s run in the 7th … retired nine of first 10 Mercer batters he faced and then set down 13 of the final 14, handing the Bears their first shutout loss in league play this season … victorious in eight straight starts … improved to 11-1 while becoming the first A-Sun pitcher to post 11-plus wins in a season since former Florida Gulf Coast standout and current Chicago White Sox ace Chris Sale had 11 wins in 2010 … the pitchers duel vs. Mercer marked only the third 1-0 win by an ETSU team since 1992 (first since ’05) … tied for third nationally in wins and owns half of ETSU’s conference victories (7 of 14) … has compiled a 2.15 ERA, with a 3.8 strikeout-to-walk ratio (61/16) and nine more innings pitched (113) than hits allowed (102; .246 batting) … has pitched 109 of the 117 total innings in his 13 starts … his 10 complete games are one shy of tying the ETSU season record (also two wins shy of matching that record), while his four shutouts already are tied for the Bucs season/career record … classic “bulldog” pitcher who also is known for his tremendous leadership and team focus … pitched only 56 innings in 2012, mostly as a reliever (18 appearances, six of them starts; 4 wins & 4 saves; 8.3 K-to-BB ratio) … had 14 multi-hit games as a junior (48 starts as a position player), one year after starting 56 games at shortstop in 2011 (.278, 5 HR, 28 RBI, only 7 IP) … named to 2010 Atlantic Sun Conf. All-Freshman Team (hit .335 with 9 HR, 23 doubles and 58 RBI) … member of Nova High School’s 2007 Floridas state championship team (class 5A). Veteran outfielder who hit .500 (8-for-16) during key week for Jaguars squad closing in on Sun Belt Conference title and looking to remain in mix for one of the 16 Regional host spots … factored into 11 of his team’s runs (7 RBI, 5 R, HR) in 3-1 week that included 9-0 midweek win over Southland Conference title contender Southeastern Louisiana and crucial series win at SBC 2nd-place team cb360 #36 Louisiana-Lafayette (9-6, 9-5, 7-17) … compiled a 1.368 OPS spanning the four games (.555 on-base pct., plus .813 slugging; HR, 2 2B, 2 BB) and did not strike out during the four games … hit 6-for-9 in first two games of the week, including 3-for-4 in shutout win over the Lions (2 RBI, 2 R, 2B, BB) … opened series at ULL by batting 3-for-5 with a home run, double, 3 RBI and a pair of runs scored … added an RBI single in series-clinching second game (BB) … closed week with another RBI single, plus a walk and run scored, in gm-3 at ULL (also fired an outfield assist for a 9-3 lineout double play) … third-year starter who currently ranks third on team with .325 batting avg., plus team-best 53 RBI (2 HR, 18 2B) … has eight more walks this season (32) than strikeouts (24) … product of Anderson (Ind.) High School. 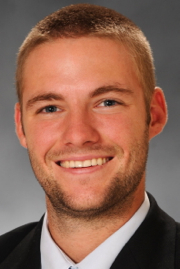 Proved his value as a clutch top two-way players during week that included split at NCAA hopeful Ohio State (cb360 #50; 9-2, 2-3) and huge series win vs. top-ranked North Carolina (5-4, 1-3, 9-8 in 12), helping team end 2-8 skid prior to OSU games … hit 9-for-24 (.375) during the week (5 RBI, R, HR, 2B) – capped by UNC series-finale heroics that included 2-out RBI single in 3-run bottom of the 9th (forcing extra innings), the winning single in the 12th and closing that game on the mound with three shutout innings (3K, BB, 10 BF) … had an RBI double in win at Ohio State, adding pair of hits in second game vs. the Buckeyes … played huge role in series-opening win vs. UNC, batting 4-for-4 with 2-run blast in 4-run bottom of the 3rd … second on team with .366 season batting avg., 14 home runs and 59 RBI (also has three saves and a 3.86 ERA in 16.1 innings) … named to 2012 ACC All-Tournament Team and a 2011 Freshman All-American … product of Roswell (Ga.) High School … uncle Ed Barney played for the Cincinnati Reds. 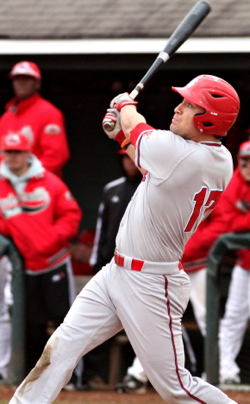 Emerging talent in the middle infield who extended his hitting streak to 17 games (5-for-13) during series sweep at in-state rival and NCAA hopeful Kansas (4-3, 9-6, 7-3) … factored into eight of the K-State runs (5 RBI, 4 R, HR, 2 2B) at KU, including a 2-run, 9th-inning blast that provided the winning margin in the game-2 comeback from an early 6-0 deficit … did not commit an error throughout the series, spanning 17 fielding chances … doubled and added a key sacrifice fly in tight series-opening win … his big effort in game-2 (2-for-5, 3 RBI, 3 R) included the biggest hit of the series: pulling a 1-out, 0-2 pitch from the Big 12’s top pitcher Jordan Piché and homering over the rightfield fence for an 8-6 lead in the 9th (9-6 comeback fro m 0-6) … also had an RBI single in the 2-run top of the 7th that tied the game (6-6) … closed series by batting 2-for-4 with another double, a walk and a 9th-inning RBI single … owns longest active hitting streak (17) in the Big 12, longest by a K-State player since 2010 and 9th-longest in program history … leads the Big 12 with a .415 batting batting avg. 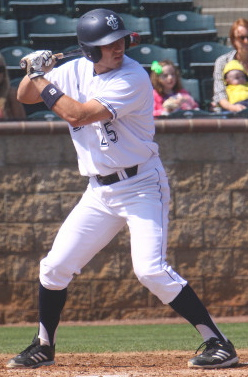 in conference play (nearly 50 points ahead of the next player) … batting team-best .358 overall (4th among Big 12 players), with a league-best 12 doubles (second on team with 33 RBI) … product of Olathe (Kan.) Northwest High School … father David Fisher played five season of professional baseball (reaching triple-A), as did a grandfather and uncle. 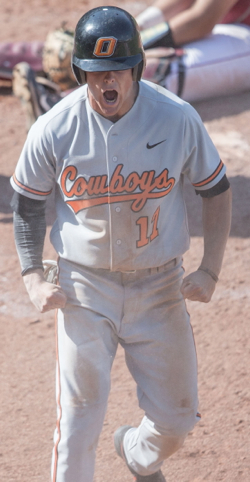 Versatile bottom-of-the lineup player who led Oklahoma State to Bedlam Series win in annual battle vs. rival and cb360 #27 Oklahoma (4-3 in Tulsa; 4-5 & 7-2 in OK City) … hit 7-for-10 in the tightly-contested series, with a couple doubles, two RBI and three runs scored (also a walk, stolen base and sac. bunt) … matched career-high with three hits in series opener (3-for-4; RBI, R, 2B) – including 2-out RBI single that plated eventual winning run in top of the 8th … started gm-1 behind the plate due to Victor Romero’s injury … typically starts in left field, with only three previous starts at catcher … played key role in gm-2 (1-2, R, BB, 2B, SAC, SB), with leadoff double in the 8th before ultimately stealing home (pictured) for valuable insurance/winning run (4-2; 4-3 final) … ended series by batting 3-for-4 with another RBI and run scored … fourth on team with .305 batting avg. (30 RBI, 2 HR, team-best 13 stolen bases) … played for his father Scott Green at Rider High School. 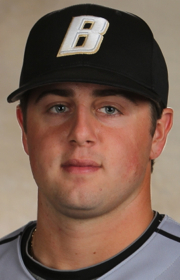 Iowa … LHP … So. 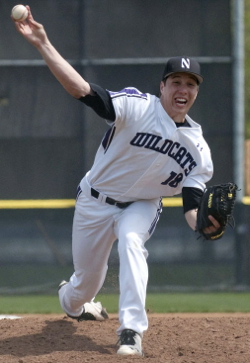 Overcame disappointing 2013 season to deliver eight strong innings in tightly-contested game-2 (a 2-1 victory) vs. cb360 #43 NCAA hopeful Michigan State … allowed the lone run in marathon 122-pitch outing while working around seven hits, one walk and a hit batter (with three srtikeouts) … opened the game with seven straight shutout innings … benefitted from keeping the ball low, as 19 of his 24 outs came via groundballs (15), strikouets (3) or infield popups (1) … overcame a teammate’s 7th-inning dropped flyout in the 7th, stranding a pair of runner to preserve the 1-0 lead … his clutch victory delivered Iowa’s first Big Ten series victory of the season (the Hawkeyes entered the series 17-26 overall and 5-13 in league play) … had won only one of his previous nine decisions this season (1-8), after earning Freshman All-America and second team all-Big Ten honors in 2012 (2.67, 6-0, 36 K/15BB, .241 opp. 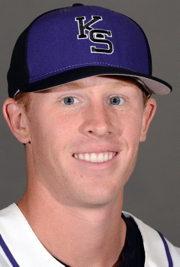 batting in 87.2 IP) … named Missouri state pitcher of the year while starring for University of St. Louis High School. 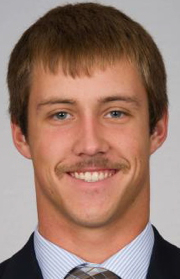 Northwestern … RHP … So. Went the distance in dominant 2-hit performance (allowed only one runner past first base) while leading Wildcats to 12-1, series-tying road win vs. a CB360 #13 Indiana team bidding to become one of 16 NCAA regional hosts … faced only 29 batters in efficient 91-pitch outing that included no walks and two hit batters … shut down prolific Hoosiers offense that led the Big Ten in batting average, slugging pct., on-base pct., walks and runs … carried a no-hitter into the 5th, after having allowed only two baserunners to that point (retired first eight) … kept the ball in the infield, with 23 of his 27 outs coming via Ks (6), groundouts (11), infield popups/foulouts (4) and the two erased baserunners (lineout double play & caught stealing) … allowed only one runner to reach second base (on Kyle Schwarber’s 13th home run trot of the season) … owns a 3.48 ERA and 5-5 record in 77.1 innings (45 K, 23 BB, 78 H/.257 opp. avg.) 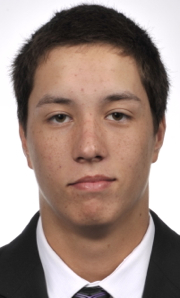 … Chicago-area product from Providence Catholic High School. 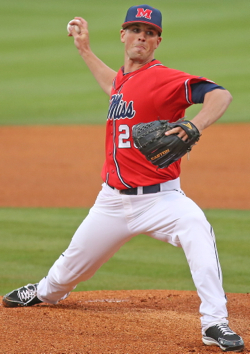 Mississippi … RHP … Jr.
Rose to the occasion after taking the mound to start resumed series opener vs. rival Mississippi State (cb360 #12), as the Rebels overcame the lost impact of ace Bobby Wahl (who had pitched only one inning the previous night before the game was halted) … matched his season-high with a 7-inning outing in 3-0 win vs. the Bulldogs, facing only 25 batters with two hits, a pair of walks and a hit batter (five Ks) … allowed only one baserunner past second base (only three in scoring position) … rolled up a timely bases-loaded double play in the 3rd and then retired 12 of his final 13 batters faced (handing off the 3-0 lead to closer Brett Huber for the 9th) … his big-game performance set the tone for the Rebels series win and near-sweep (3-0, 10-8, 6-7) while lifting Ole Miss into 5th in the SEC overall standings … product of Grove City (Ohio) High School. 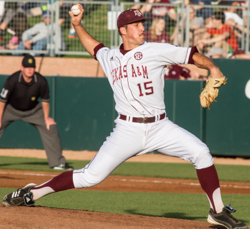 Texas A&M … RHP/DH … So. Tw0-way starter who delivered a much-needed, resume-boosting victory for the Aggies, after logging eight impressive innings in 2-1 victory over one of college baseball’s elite teams (cb360 #3 LSU) … limited the potent LSU offense to five hits (three singles and two doubles) … struck out five and did not issue a walk en route to logging his second consecutive 8-inning, 1-run outing (beat Missouri by the same 2-1 score the previous week) … faced more than four batters in an inning only once, highlighted by four 1-2-3 innings … induced a double-play ball back to the mound to end a runners-on-the-corners threat in the 4th … pitched under the pressure of a series opener that was scoreless entering the 6th (his only run support did not come until the 7th, with the pair of runs) … also hit 2-for-7 as the Aggies DH during the series, with a solo home run in the game-2 loss (7-4) … dropped his ERA to 2.01 (9th-best in the Big 12) spanning 89.1 innings, with a 6-3 record and a 4.2 K-to-walk ratio (76/18) and nearly 30 more innings pitched than hits allowed (60) … his .192 opp. batting avg. is 5th-best among Big 12 pitchers … batting .275 (14 RBI, 3 HR, 2 3B, 2 2B) … earned All-America honors as a pitcher at Houston-area Westlake High School. 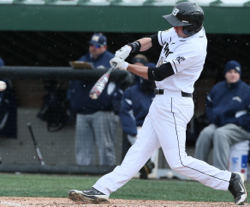 Surging rookie who hit .462 (6-for-13) and made several impactful defensive plays at second base, as league-leading Bryant held off Northeast Conference perennial power and 2013 title contender Monmouth in 4-game series(1-4, 9-0, 4-3, 7-3 … helped Bryant inch closer to NEC title in its first season as a full member of the conference (previous played as transitional NEC team), in first official DI season … collected hits in all four games of the series while providing timely roles on four runs (2 RBI, 2R) and striking out only once all week … hit 2-for-3 with (RBI, R) in 9-0 win that quickly offset series-opening loss … made a pair of huge, back-to-back defensive plays in 4th inning of that gm-2 victory (with Bulldogs leading only 1-0): first on a based-loaded situation (groundball backhander led to 3-2 double play) and then by picking out a tough ball in the dirt (shortstop had gone deep in the hole) to save a run … Bryant went on to score seven runs the next inning to break the game open … later that day in second game of doubleheader (7-inn. game), singled and scored winning run in bottom of the 7th (minutes after Monmouth had tied the score) … played lead role in series-clinching finale (7-3), batting 2-for-3 with an RBI and base on balls … ended Monmouth series riding a 10-game hitting streak (14-for-32/.438, with 14 RBI) … batting .294 for the season (22 RBI, 5 2B, 12 BB) … product of Providence-area Moss Brown School and post-graduate Worcester Academy. 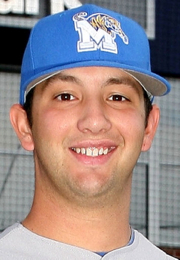 Memphis … LHP … Jr.
Extended his streak of not allowing an earned run to 18 innings while posting series-clinching, 3-1 win at CB360 #22 Rice … logged his second straight complete game in the clutch performance vs. the perennial national power Owls, as Tigers continued their climb up the Conference USA standings … did not allow an earned run (unearned run in the 6th) while facing only 33 batters in the 115-pitch outing, with seven strikeouts, six hits allowed and one walk … 21 of his 27 outs came via Ks (7), groundouts (10), infield popups (2) and two erased baserunners (caught stealing and a 1-3 pickoff) … did not receive any run support until the 6th (0-0 through 5) … Rice’s score in the 6th was his first run allowed in 15.2 innings … allowed only three runners into scoring position … his fifth complete game of the season lowered his ERA to 2.45 to go along with a 7-3 record and 3.3 K-to-walk ratio (79/24) and 24 more innings pitched (91.2) than hits allowed (68; lowly .208 opp. batting average) … played at Collierville (Tenn.) High School for current Memphis head coach Jeff Hopkins. 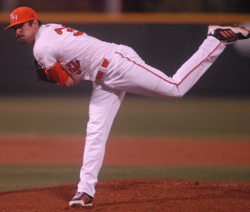 Sam Houston State … LHP … Jr. 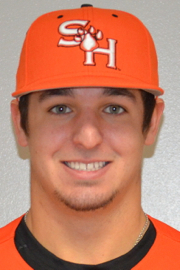 Faced only 30 batters en route to 3-0 shutout, as Bearkats posted game-2, series-clinching road win over fellow Southland Conference title contender Southeastern Louisiana … had only three strikeouts (also only one walk) but pitched around a pair of Sam Houston errors … induced a pair of timely double-play balls, part of his 17 outs recorded via groundballs (two other outs stayed in the infield, on a lineup and popup) … did not allow a runner into scoring position (none reached third) until the 8th inning … the only Lions runners that reached second base both did so courtesy of errors (in the 8th and 9th), one of them quickly followed by game-ending double play … logged five 1-2-3 innings … impressively has held opposing hitters to a combined sub-.200 batting avg. 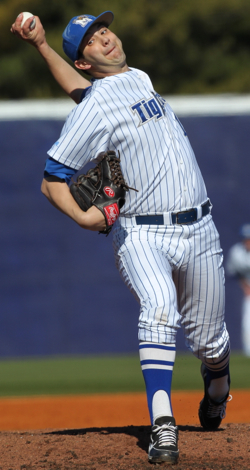 (.189) while fashioning a 2.84 ERA and 7-4 record (64 K/50BB, 50 H in 76 IP) … product of Huntsville High School. Continued to swing a hot bat during key series win vs. cb360 #28 Cal Poly (7-1, 3-4, 11-1), as bubble team Irvine registered a much-need pair of quality wins … hit .538 (7-for-13) in the Cal Poly series with 14 total bases (1.077 slugging pct.) 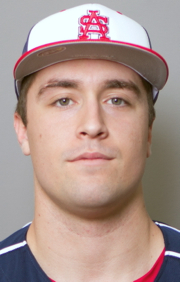 … factored into eight runs vs. the Mustangs (4 RBI, 4 R, HR) while hitting for the cycle over the course of the series (HR, 3B, 2 2B) … 3-for-5 effort in the series opener (2 RBI, 2 R) included his ninth home run of the season and team-leading fourth triple … stroked RBI double and also had a walk and scored a run in narrow game-2 loss … capped series with another 3-for-5 day (RBI, R, 2B) … ranks second among Big West hitters in batting avg. (.363) and is the league’s slugging pct. 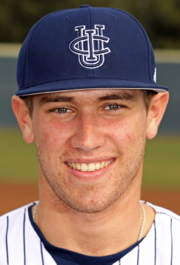 leader (.363), also leading UCI with 43 RBI … product of St. John Bosco High School.